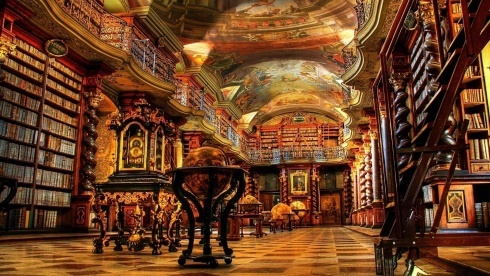 Clementinum National Library, Czech Republic | The 15 World's Most Beautiful Libraries! Clementinum National Library was established in 1722. Inside you can see the mural painting. They depict scenes devoted to science and the arts. The dome is also decorated with paintings. Large globes are In the center of the room. Collection of library is mainly theological books written in different languages.